It is no news that the Samsung Galaxy series of smartphones have changed the way we view mobile phone technology today; rivaled only by the Apple iPhone and a few others. Everyone was very content with the revolutionary Galaxy S3 smartphone and with the lasting impressions its predecessors had, everyone would expect the new Samsung Galaxy S4 to be from outta space. A straight to the point fact is that Samsung did not disappoint with the unveiling of the S4 – a phone boasting specs to further establish Samsung’s dominance of the mobile world. It’s a 5-inch beast, packing a full HD screen, a searingly powerful quad-core processor, 2GB of RAM, a host of Samsung software extras, a 13-megapixel camera and 4G LTE connectivity for super fast data speeds. 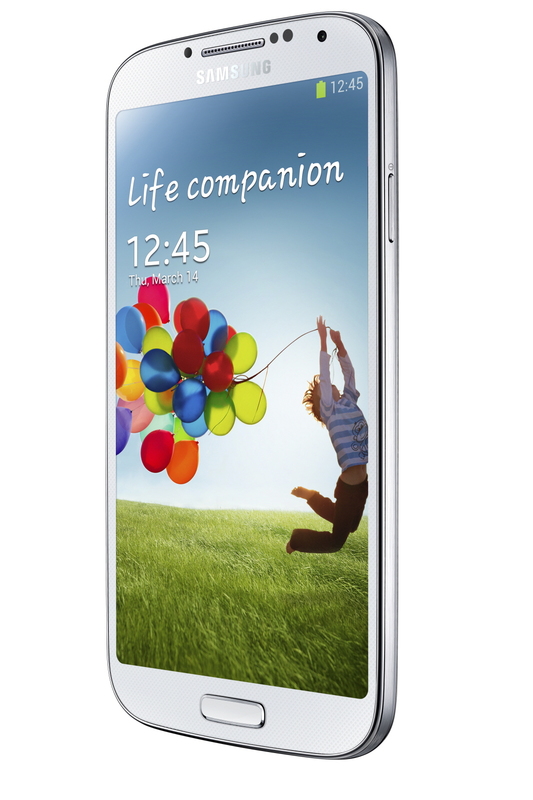 Taking a look at the Samsung Galaxy S4 from the front, you’ll have a tough time telling it apart from the S3. Samsung has a bunch of new sensors scattered around the Galaxy S4’s body, but the general layout of controls is largely unchanged. 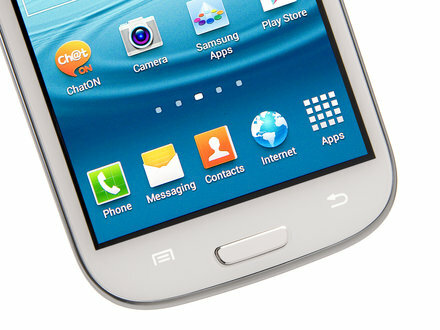 Below the Screen, we find the typical physical Hardware sandwiched between the capacitive menu and back keys as on the Galaxy S3. There’s some extra functionality upon a long press too – the Menu key handles Google Now, while the Home key brings up the task switcher. Pressing and holding the back button brings the side bar for the Multi- window feature (if it’s enabled), and if you click the home key twice the Samsung S voice virtual assistant kicks in. The traditional ambient light and proximity sensors are joined by an IR gesture sensor, which enables the cool Air gestures in applications such as the web browser and music player. There’s also a 2.1 megapixel front-facing camera for video calls and a status LED. The volume rocker is on the left side of the Samsung Galaxy S4, while the power/lock key is on the right. Despite the proper camera upgrade on the Galaxy S4, the new flagship is still missing a dedicated camera key; and though the volume rocker can be used for snapping photos, it can’t quite match a two-stage button. One of the most important updates that the Samsung Galaxy S4 brings is the new 5 inch Super AMOLED screen of 1080p resolution. While it does have a PenTile matrix, the 441 ppi pixel density makes sure you enjoy the screen. Its impressive contrast and almost perfect viewing angles make everything on the screen pop, regardless of your viewpoint. The color saturation is beyond the reach of any LCD out there, which makes even the dullest of images appear remarkably vibrant. For non-fans of the over-saturated look of AMOLEDs, Samsung gives you the option to tune down the saturation to more natural levels and enjoy the best of both worlds. There’s a dedicated Adobe RGB setting that gets this done. We start with the lockscreen, which features the new lockscreen widgets introduced with Android 4.2, though Samsung fiddled with them a bit. The default lockscreen shows the time along with a personal message overlaid on beautiful photos pulled from TripAdvisor (with text at the bottom about where the photo was taken). Samsung replaced the water ripples by a lens flare effect, if you prefer, you can switch back to the old one or disable it all together. Another cool feature is the Quick glance option we first saw on the Samsng Galaxy Note 2 which uses the proximity sensor to detect you reaching for the device and lights up the screen that shows the time, missed call and message counters, battery charge and music track info. At the top is the notification area which offers quick toggles (five or eight in landscape mode) to enable and disable features. There are more than five toggles, you can swipe horizontally to get to the others. Or you can tap the new button that reveals a grid of all the shortcuts, 20 in total. You can rearrange this grid (the top row toggles are always visible). A two finger swipe directly opens the grid of toggles. The Galaxy S4 comes with the multi-window feature. This allows the use of apps (two apps) side by side on the screen and you can adjust the division line giving one app more space; something similar to the “snap-in” function of Windows 8. Only compatible apps can be used with the multi-window, and that means mostly the ones that come preinstalled on the phone. You can move the small arrow that brings up the drawer with the multi- window apps to make it easier to reach with your thumb. You can also move the whole drawer to the other side of the screen. The settings menu has been redone in the latest TouchWiz version. Instead of a scrollable grid of icons and sections Samsung has went with a tabbed interface. On top you get four tabs – Connection, My device, Accounts and More. you can find relative features in their corresponding place – display, for instance, is in the My Device tab. It makes navigating the settings menu much faster and more intuitive. The first is Air View, which debuted on the Galaxy Note 2 and worked with the S Pen. 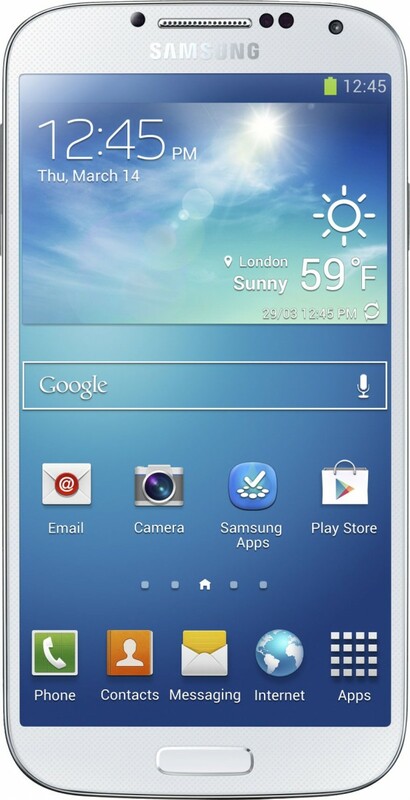 There’s no S Pen on the Galaxy S4, or a need for it because the phone can detect your finger hovering over the screen. This enables information preview, previewing videos just by pointing to a spot in the timeline, moving to the next track in the music player by hovering over the next button (works with previous button too), previewing folders, speed dial contacts, and even magnifying links in web pages. Air view detects fingers 1cm away from the screen. Another set of “air” features are the Air Gestures. Quick Glance is one of them, but there’s more. The rest of the air commands are triggered by waving your hand over the Galaxy S4. Air Gestures turns the S4 into a mini-Kinect. Air Gestures can detect your hand up to 7cm and might prove useful in some situations. The sad part to this feature is that it only supports native apps and third party apps will not work with them (inclusive of Google Chrome that comes preinstalled on the phone). The familiar Smart Stay and Smart Rotate features are enabled too. Smart Scroll is one of the two new features on the Galaxy S4. It allows you to scroll up and down by tilting the phone or by tilting your head. The second new feature is simpler and more useful – Smart Pause. While watching a video, it uses the front- facing camera to track your face and will automatically pause the video when you look away. Look back and the screen and the playback continues. If the promise of the Samsung Galaxy S4’s 13-megapixel images doesn’t wow you, Samsung is hoping that its refreshed interface and enhanced features will. Perhaps the face and will automatically pause the video when you look away. Look back and the screen and the playback continues. can choose to change the window size and shape on top, say a postcard stamp, an oval, or a simple window. You can also swap camera positions so that rear-facing gives you the inset and the front-facing image forms the background. More new modes include Sound & amp; Shot, which takes a picture and captures up to 9 seconds of audio and Drama Shot, which combines all the actions from a burst shot into a single frame. If someone is jumping, for instance, you see all stages of the leap in one shot. Then there’s Cinema Photo, which lets you animate just one portion of a video and keep the rest static, and Eraser mode, which can erase an unwanted person from a shot. You’ll also find Story Album, which gathers friends into a single photo album. You can add more location-based detail, and you can print any album through self-publishing platform Blurb. 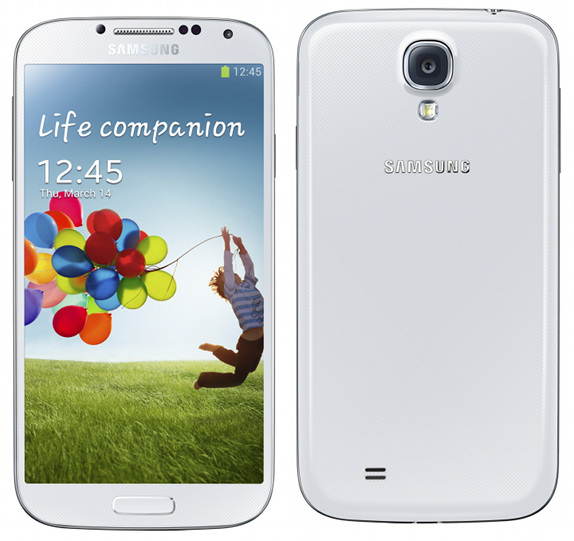 The Galaxy S4 features an Exynos 5 Octa 5410 Quad-core 1.6 GHz Cortex-A15 & quad-core 1.2 GHz Cortex-A7 processor with a 2GB RAM. It comes in 16GB, 32GB or 64GB storage options (expandable to 64GB via micro SD). As for battery life, the Samsung Galaxy S4 is packed a large 2,600mAh , but also a larger screen and even more features to compromise performance. Smart Stay and S Voice both drain the battery more quickly. The Samsung Galaxy S smartphones have always been a dominant force in the smartphone world and with the release of the Galaxy S4, Samsung is here to stay at the top. With such stunning features already discussed, this phone is a beast! Possible downsides of the phone would be its wallet shrinking price, its plastic design and the fact that there’s no FM radio. If you’re interested in a super phone, a strong gaming phone or possibly the ‘best’ android phone there is… the Samsung Galaxy S4 is surely the phone for you!